Bogdan's SolarOS is an epitome of dedication and commitment. I've been trying to revive my almost dead operating system now and then, but it just seems impossible to find any time to work on it. It is amazing how things look exactly the same as it used to seven years back. (for anyone interested, the old screenshots are here. ). Accounting for a rare possibility that someone might actually be interested to test it out, here's where you can find it. This is probably the best feeling ever. As you can see today I managed to load my 32 bit kernel for the first time. All in all don't let people discourage you. Writing a bootloader is hard, but is it impossible? No! It definitely is possible, just takes time and practice. This project was a nice assembly learning experience. I you want to do something similar just don't follow the online tutorials, they are the worst! (when you start to understand how stuff works you realize it) If you understand how something works, you can code it. After many problems, CHicago now has a working virtual memory manager! 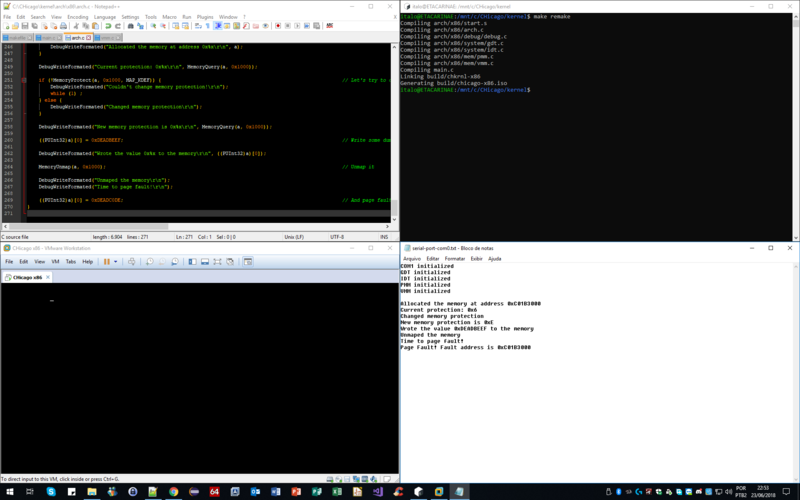 Python successfully running (with windowing system bindings!) in ToaruOS-NIH, with a fully custom C library. Python itself is the only third-party code here. Holy damn, that looks sooo good !!! Meme-deving since 420 Bc ! 1 year of development... and now it's working on real hardware!! Implemented multitasking for the first time ever. Simple round robbing scheduler. I still need to fix a bug where one of the tasks is simply skipped. Hi, this is my first post in this group. Decided that after 8+ years of reading all the cool things posted here, it's time to share something I worked long time ago. I call this operating system "CatOS", because cats are cool, and it rhymes with "MacOS". I'm not sure when I'll ever have chance to continue work on this, but if I ever get any progress I'll post it here. Managed to do some more work on my user interface after fixing a lot of errors related to the IPC in my system. Also finally got text-rendering up and running. The buttons are not yet connected to any functionality, I still need to connect a few things to handle the user input in the window manager, but I'm pretty proud of the progress!